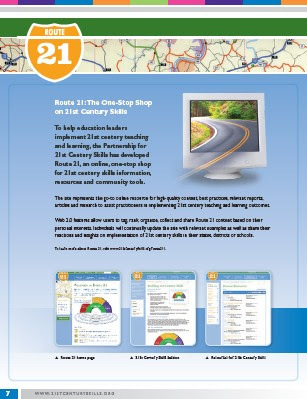 To help education leaders and policymakers implement 21st century teaching and learning, the Partnership for 21st Century Skills launches Route 21, an online, one-stop shop for 21st century skills-related information, resources and tools. Route 21 showcases how 21st century skills can be supported through standards, assessments, professional development, curriculum and instruction and learning environments. The site represents the first comprehensive, go-to online resource for high-quality content, best practices, relevant reports, articles and research to assist practitioners in implementing 21st century teaching practices and learning outcomes, according to the Partnership. The Partnership for 21st Century Skills is the leading advocacy organization focused on infusing 21st century skills into education. The organization brings together the business community, education leaders and policymakers to define a powerful vision for 21st century education to ensure every child's success as citizens and workers in the 21st century. The Partnership encourages schools, districts and states to advocate for the infusion of 21st century skills into education and provides tools and resources to help facilitate and drive change.